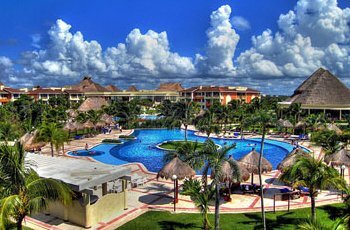 Gran Bahia Principe Coba All Inclusive Resort, an amazing 5 star hotel in the Mayan Riviera, is an excellent choice for your next Caribbean vacations. The resort is located on a beautiful white sand beach in Akumal, a tourist resort area in Quitana Roo, Mexico. Gran Bahia Principe Coba is committed to the protection of the natural environment and is in perfect harmony with the surroundings. 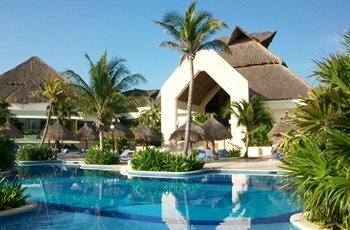 Lush tropical gardens, exuberant vegetation and protected areas make Gran Bahia Principe Coba All Inclusive Resort incredible facilities and varied services one of the best in the Mayan Riviera. Gran Bahia Principe Coba All Inclusive Resort, is designed with your comfort in mind. It is the perfect place to unwind and feed your soul and body. After a few days at Gran Bahia Principe Coba All Inclusive Resort you will be rejuvenated and you will certainly have the feeling of having lived the time of your life. Gran Bahia Principe Coba All Inclusive Resort offers guests the opportunity to discover an astonishing underwater world, a great variety of tropical fish, unbelievable marine vegetation, all kinds of sport facilities and excellent Spa services that will guarantee you a total relaxation. Guests staying at Gran Bahia Principe Coba All Inclusive Resort can enjoy a wide range of water and land sports. You can try windsurfing, scuba diving, go sailing, get a Banana Boat, or take a catamaran ride. Don’t miss the chance to join a volleyball game, play tennis or golf and take aerobics classes. Dance classes are also available. You can also go horseback riding and enjoy the beautiful surroundings. And if you are looking for fun, Gran Bahia Principe Coba All Inclusive Resort animation team offers day and night entertainment shows, you can laugh with them. After a busy day, Hacienda Dona Isabel will be a great entertainment choice. A Caribbean 16th century style village offers guests a lot to choose from. La Rancherita, a popular disco not only among the guests, but also for visitors organizes contests and very interesting theme parties. A wide variety of shops that go from a boutique or a silversmith's to jeweler's, beach clothes, music, photo shop, souvenir shops, florist's, medical services, car rental, hairdresser's and massages, restaurants and bars, are also the guests’ favourite. At Gran Bahia Principe Coba All Inclusive Resort you will find everything you can think of. A buffet, five a la carte restaurants and a snack bar will satisfy dining needs of even the most demanding guests staying at Gran Bahia Principe Coba All Inclusive Resort. The buffet offers a wide selection of International dishes and is open for breakfast, lunch and dinner. You can choose from 10 specialty restaurants: a Mediterranean Specialty Restaurant, a Fish & Seafood Specialty Restaurant, Gourmet International Specialty Restaurant, a Japanese Specialty Restaurant, a Mexican Restaurant, a Grill, an Oriental Restaurant, El Pescador Restaurant or two Italian Specialty Restaurants. A Snack Bar offers fast food and snacks and is open 24 hours a day, although after midnight it only serves soft drinks. Seven bars complement this service: two swim up bars, a Jacuzzi Bar, a bar at the Amphitheatre, a Lobby Bar, a Snack Bar and a Piano Bar. Gran Bahia Principe Coba All Inclusive Resort offers guests 1080 Junior Suites spread around in 3 storey villas tha have 36 rooms each. There are also 6 rooms especially designed for guests with physical disabilities. 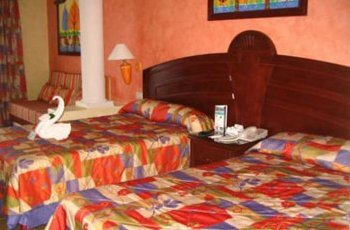 All rooms at Gran Bahia Principe Coba All Inclusive Resort rooms include a Jacuzzi, 2 Queen Size or 1 King-Size bed, air conditioning, a full bathroom, a hairdryer, satellite TV, direct telephone, a mini-bar, balcony or terrace and a security box (extra charge). 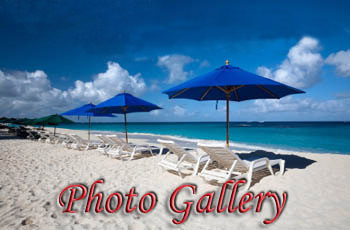 There is also an area at Gran Bahia Principe Coba All Inclusive Resort known as the Club Golden Principe. It is a quiet private club that offers guests exclusive services and facilities apart from all other services offered at the hotel. . If you are thinking of getting married, Gran Bahia Principe Coba All Inclusive Resort is the ideal place for your wedding and honeymoon. Apart from the beautiful surroundings and amazing facilities Gran Bahia Principe Coba All Inclusive Resort staff will do their best to make of your Gran Bahia Principe Coba Wedding a memorable experience.